Riverwalk 2017: The longest yet! What? 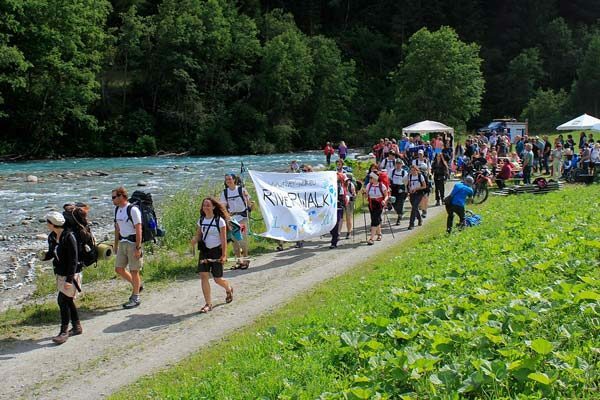 20 young adults (15-30 years old) from Austria, Switzerland and Germany discovered the Inn by hiking, cycling and rafting more than 500 km from the source of the river to the confluence with the Danube. The goal of Riverwalk 2017 was to discover, protect and raise awareness of the importance of large, “living rivers” such as the Inn and explore local initiatives for renaturation and eco-friendly uses. Find more information about the Riverwalk here: www.river-walk.eu. Also, check out our Facebook page: www.facebook.com/RiverwalkEurope! Generation Earth supports the Sustainable Development Goals of the United Nations. This action project supports goal #15 life on land. Learn more about the 2030 agenda and the Global Goals by clicking here!